The 2014 version of the Fantasy Baseball Draft Guide features more than 100,000,000 words of fantasy baseball advice spanning 100+ pages. Okay, the amount of words may be embellished a bit, but the guide is indeed 100+ pages in length. LEARN HOW TO GET THE DRAFT GUIDE FOR FREE! 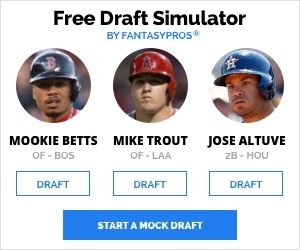 Additionally you will find a 15-team mock draft with some of the most respected fantasy analysts in the industry, complete rankings and auction values for close to 350 players, the ultimate Twitter guide for #fantasybaseball, tutorials on how to use your favorite websites to get a leg up on your opponents and team profiles for each MLB team. The 2014 Fantasy Baseball Draft Guide also includes excerpts from Jonathan Bales’ book “Fantasy Football (and Baseball) For Smart People. Additionally, the guide features an excerpt of Larry Schechter’s best-selling novel “Winning Fantasy Baseball” regarding your auction draft strategies. Paul Sporer, author of the SP Guide, contributes an article on starting pitchers with value in your fantasy baseball drafts. Our 15-team Expert Mock Draft includes Tim Heaney (KFFL), Eno Sarris (FanGraphs), Derek Van Riper (RotoWire), Mike Stein (Fantasy Alarm), Paul Sporer (Baseball Prospectus), Derek Carty (DFSEdge), Ben Pritchett (Fantasy Insiders), Ray Guilfoyle (Fake Teams), Drew Silva (RotoWorld), Alan Harrison (TheFantasyFix.com), Nick Raducanu (FantasyTrade411), Dalton Del Don (Yahoo), Steve Gardner (USA Today), Jake Ciely (RotoExperts) and Brett Talley (TheFantasyFix.com). 2. Log in or register for an account at the Fix. 4. 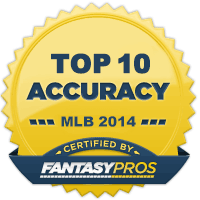 Make your payment of $10.99 for ONLY a copy of our 2014 Fantasy Baseball Draft Guide. 5. Once payment is complete, you will be redirected (or provided a link) to return to your “members only” area. 6. In your “members only” area, you will find your download. Find out more about the “Front Office” premium package here!